Jo & Saan’s Teaching Session is no longer active. If you missed this teaching session or would like to hear it again, the 2016 Tele Summit is available for purchase here. Saan Ecker has a PhD in Human Ecology and over 10 years experience as a senior social science researcher. 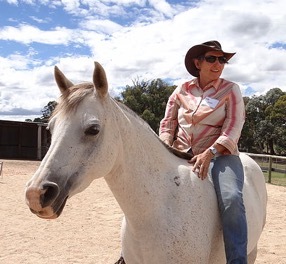 Saan is currently undertaking Psychology Honours exploring the mutual impact and benefit between human and horses. She draws on a lifetime of building relationships with her own horses as well as qualitative and quantitative research skills. Saan is a certified therapist having completed a Diploma of Buddhist Psychotherapy and is a trained teacher of mindfulness meditation. She is also a certified action learning coach under the World Institute for Action Learning and a systemic constellation facilitator. Saan offers groups and individuals new ways to see the issue of concern and helps to extend thinking beyond the thinking that created the problem using a range of holistic and systemic approaches. She works from a philosophy that individual and family, community and global issues are linked and that a holistic view is needed. Saan has used constellations extensively in organizations to solve problems through exploring the relevant systems dynamics. Saan’s leisure time is largely spent amongst our herd of Arabs, probably out walking and talking with Peakgrove’s stallion, Indi.